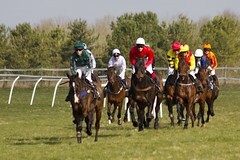 As a child, my parents used to regularly take me point-to-point racing. I wasn’t very interested in the horses, but there were often trees to climb and always a picnic and friends in droves. My parents used to “have a flutter” on the races but of course I never gambled – too young. We had to drive for miles and miles to get there, but all the fresh air, food and fun used to make it a highlight. Fast forward 40 years (gulp), and I’ve still never bet on a horse race. I was over at Stonehenge a few weeks ago taking visitors to see the rocks, and noticed in the hedgerows a still-familiar set of signs for the races. Painted on wooden slats, the same signage was in use in the 1960 and 70s. I saw that the Larkhill races were happening this weekend and told my daughter (an avid equiphile and lover of racing over jumps). Larkhill was one of the more distant destinations my parents used to take me to, and I (just about) remember it as having very poor tree-climbing facilities. Still, the experience as a whole all came flooding back to me. That was all it took. We headed out today (sans picnic) to find the races again after so many years. I live closer now so it was a fairly quick drive to the middle of Salisbury Plain. The byways to the fields are gritted these days, so no fears of tractor-propelled exits that I remember from my childhood, but everything else was still exactly the same. We paid for our pass, drove into the field, found a space near the last jump (number 5 on the map) and settled to watch the racing. It was like stepping back in time: announcements on trumpet-like loudspeakers, a rickety sign with wooden slats hauled on ropes showing the runners for each race, red-coated riders from the New Forest Hunt patrolling the fields on horseback, raffles to raise money for the hunt, trashy outdoor food on sale (pasties! a beer tent! candy floss!) 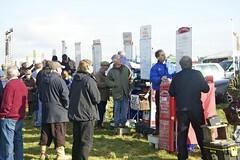 and a line of bookies by the paddock. I’m not usually a betting man (my grasp of statistics is weak but good enough to tell me it’s foolish to gamble against professionals), but I was surprised to discover that I could still read the racing form in the race card and the temptation grew too. My daughter was certain that the favourite was going to win, at fairly short odds that weren’t worth considering, but I saw another horse I thought had a good chance and so decided to risk my £2 coin at 4-1. Bookie time. While they may look timeless with their leather bags and wooden trestles, the bookies have modernised. They now have whiteboards instead of blackboards, but there’s a more radical change. No more coloured cards with interesting markings that I remember playing with as a child when my parents lost. These days, even in the middle of a field in the middle of nowhere the bookies all have computers that issue betting tickets. So I paid my coin, took my ticket and headed back to the track. It was a close race, and my daughter was right about the favourite. She has an eye for horses and I think if I was ever to take up racing seriously I’d want her to be my advisor and cashier. But in this case, the rider was very unfortunate and broke his stirrup just before the final jump, leaving my horse with a clear run to the finish. Amazingly, my only ever bet on a horse won. I went back, joined the line and claimed my crisp £10 from the bookie. 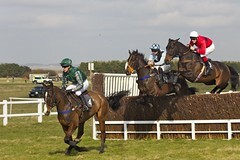 While the gambling isn’t my thing, I can see we may well be back at Larkhill at some point, maybe even soon. The sun shone, the sky was blue, I was able to take photographs and there were even skylarks. But next time, we’ll take a picnic.